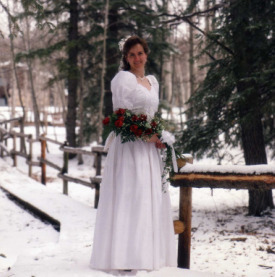 When I think of winter wedding ideas, I picture a Snow Princess, elaborately dressed in white. 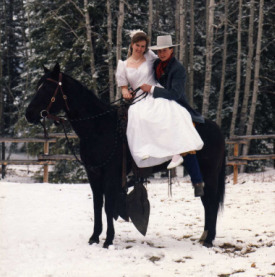 Here's some thoughts for your winter wedding ideas Picture this, a Bride with the most gorgeous white gown and winter cape. The hood is trimmed with thick fur and, her hands on her lap, kept warm by a matching muff. Maybe she is sitting in a sleigh covered with white roses or lilies. Leading the way, are two majestic white horses. The hansom and debonair Groom (prince)is waiting for his true love to arrive, to be whisked away to begin a new life together Well we can dream can't we, but this is not totally impossible This idea could be one of the easiest to plan. As long as you have snow on the ground and a clear sunny day. The guests may need to dress warm depending on the temperature that day. 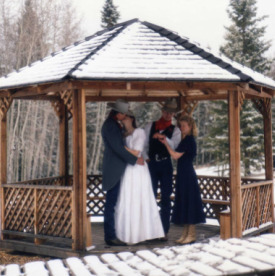 This couple decided to get married in an ice castle, That would be a cool wedding location. Be an Ice Princess for a day! These photos were taken at my Nephew's Prairie Wedding.